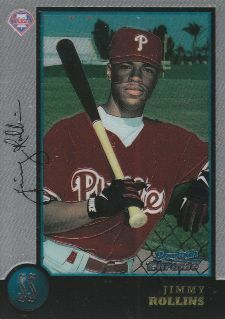 Although not as popular as other Chrome sets, 1998 Bowman Chrome Baseball still has some of the top rookie cards of the year. 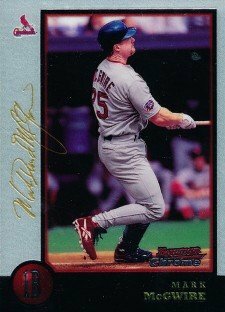 Based on the success of 1997 Bowman Chrome Baseball, Topps expanded the release to two series to match the look and numbering of 1998 Bowman Baseball. 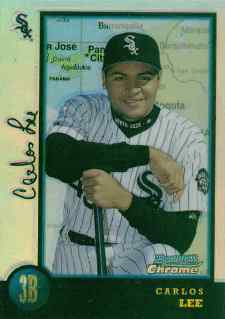 A complete set of 1998 Bowman Chrome consists of 441 cards: 221 in Series 1 and 220 in Series 2. With rookie cards driving sales, the inserts were kept to a minimum. Parallels included International (1:4), Refractors (1:12), International Refractors (1:24), Golden Anniversary (/50, 1:164) and Golden Anniversary Refractors (/5, 1:1279). The only standalone inserts are Bowman Chrome Reprints (1:12, Refractors 1:36), which gave a chromium spin on 50 of the most popular Bowman cards released since 1948. The odd numbers were inserted in Series 1 while even-numbered cards followed in Series 2. 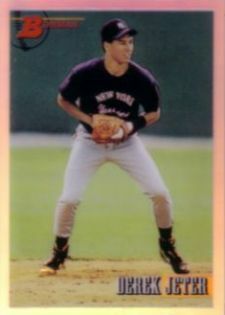 I have a 1998 bartolo colon #74, Upper Deck Collectors Choice. I think it’s an error card because the innings pitched stat is off, it states in ’97 he pitched 94.0 innings, but his 1-YR totals states he only pitched 13.1, so my question is it an error card? I think it is ,but I can’t find anything about it. Any help would be greatly appreciated, thanks. Tim Simms (ID 60191) � It very well could be an error but it’s extremely doubtful it was corrected. That’s what I thought,Thanks for the help.